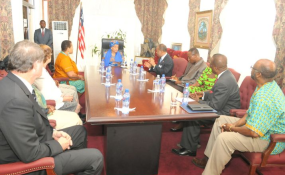 The U.S. delegation to the Partnership Dialogue meets President Ellen Johnson Sirleaf. As she begins a trip to Ghana, Liberia and Senegal this week, Elizabeth Littlefield, president and chief executive officer of the United States government's development finance agency, the U.S. Overseas Private Investment Corporation (OPIC), outlines how private-public investment partnerships can help boost growth. A generation ago, many nations across sub-Saharan Africa had to promote their markets to global investors largely on the basis of promise, the bright future over the horizon. Today, the case could not be more different. Tangible, compelling and vivid proof of progress is everywhere at hand. The rate of economic growth during the past decade has been roughly double the rates of the 1980s and 1990s. Africa's economy once rose and fell in tandem with natural resource prices. Now most growth comes from sectors such as transportation, manufacturing, telecommunications, wholesale and retail. While this is long-overdue good news, any African will tell you the news could easily be much better. Even as Africa grows each year, more than half of Africans—some 600 million people—still live without that basic prerequisite of a modern global economy, reliable electricity. The number is hard to conceive. Imagine the productivity loss from a one-day blackout for every nation of Western Europe plus Japan and South Korea. The population of those nations combined roughly equals the number of Africans who live without power annually. How can Africa fully compete when countless factories and computers go dark during rolling blackouts? How can it compete in an era of non-stop, round-the-clock communication when millions go home to candles or lanterns? Education is stunted. Healthcare suffers. Africa's power deficit is so pervasive that it shaves an estimated two percent off the continent's gross domestic product each year. President Barack Obama's “Power Africa” initiative, announced this June, steps up to this challenge, and it does so in a new, innovative way. Rather than trying to raise and direct donor money from development agencies and foreign countries, the main objective of Power Africa is to harness and catalyze private investment for electrification. President Obama believes Africa's power shortfall can best be solved through the rapid, relentless innovation and cost-conscious refinements encouraged by market discipline. Rather than focusing exclusively on mega-projects, Power Africa will foster a diversity of projects: mini-grid, off-grid, conventional fuels and renewables, as well as efficiency-enhancing projects in transmission and distribution. The aim is to double access to electrical power across sub-Saharan Africa. The model is to leverage every one dollar of public funds into at least $2 of private capital—provided investors are willing to meet minimum environmental and social standards, and operate with sound corporate governance. Never before have entrepreneurs and investors been enticed to take and give such a pivotal leadership role in addressing Africa's problems at the intersection of economic growth, social progress, and environmental sustainability. This public-private financing approach is viable. My agency has been making it work in Africa for four decades. Over the past decade alone, OPIC has supported over $1 billion in power projects across Africa. Currently, we have more than $4 billion in investments here, and it has been one of the fastest growing segments of our portfolio in recent years. In Togo, for example, we provided loans and political insurance to a public-private, tri-fuel power plant that tripled energy production in the nation and helped reduce blackouts that were crippling to businesses and homes. Just weeks ago, OPIC approved $185 million for a solar park that will feed power into the South African grid. In addition to increasing electrical capacity, it will create good local jobs. The manufacturer and supplier of the solar modules for the park is majority-owned by South Africans. As the sole development finance agency of the United States, we are capable of providing financing, guarantees, political risk insurance, and support for private equity investment funds. The key difference between OPIC and a private investor, however, is that we participate in a project only if it will generate jobs, improve lives or help communities. We also have a mandate to foster solid business practices and the highest standards of transparency. Accountability is essential. OPIC does not merely hope that such benefits will be generated by our projects. We track results. We evaluate effectiveness. We constantly learn from our experience in projects large and small. One of my primary goals in my visit to West Africa is to listen. We want to hear investment ideas of all types—large or small, high-tech or low-tech. We seek disciplined partners who can combine their unique knowledge of local markets with a passion for commercial excellence and making an impact on people's lives. At OPIC, we believe that true partnerships of shared purpose, returns and impact do more than fulfill our promise to investors. They fulfill Africa's promise to future generations.